I moved. To the pacific Northwest. After 6 months of limbo, of being in between, I moved into a new house, and for the first time, a studio of my own. A lot of stepping and a lot of unknown!! As I reflect on my first steps into this new space and life, I am reminded of the teachings I have been gleaning thus far: Be open to possibility. Be present. To be open and let life come through is to let whatever is, come through, whenever it is coming through…. sun when it is sunny and rain when it is cloudy and stormy. That pretty much means living with the unknown and inviting the unknown. So there I am stepping into my new space, stepping into my unknown. All I really have with me the first day into my new space is “be open to possibility and be present,” and a lot of feelings. I have my own, related to moving, plus those related to the tsunami having struck Japan a few days before. They are all there. That’s my starting point. That first day in my new studio, I grab what I can, a table top, 2 cabinets, ink, paper, pen, whatever is within easy reach, aka not buried deep in boxes, and get to work. Those first marks are quick sketches. Bodies lying. Lying in rest. Looking rather familiar (see early 2010 post)…Departing souls all over again….!!! How pertinent….and unnerving too. Experiencing, loss and grief, in the personal and universal realms, simultaneously, it is a lot of sensing. Over a period of days, these images get transformed. Layers of ink washes come and go, embodying layers of these emotions. Stepping into a new place with feeling overwhelmed, feeling grief and loss. Storm and waves passing through. Not exactly a comfortable place to be. Letting it through the best way I can. Open to possibility and being present. Honoring what is. – that’s the only way I know how to step into the unknown. “Gliding to the place of dreams” is what the piece of music Calming Your Mind evokes for me. It is also while listening to this piece of music that the words “departing souls” appeared. Stepping into the unknown – honoring what is, exploring what is. It’s what I do to find a way to journey forth into the unknown. 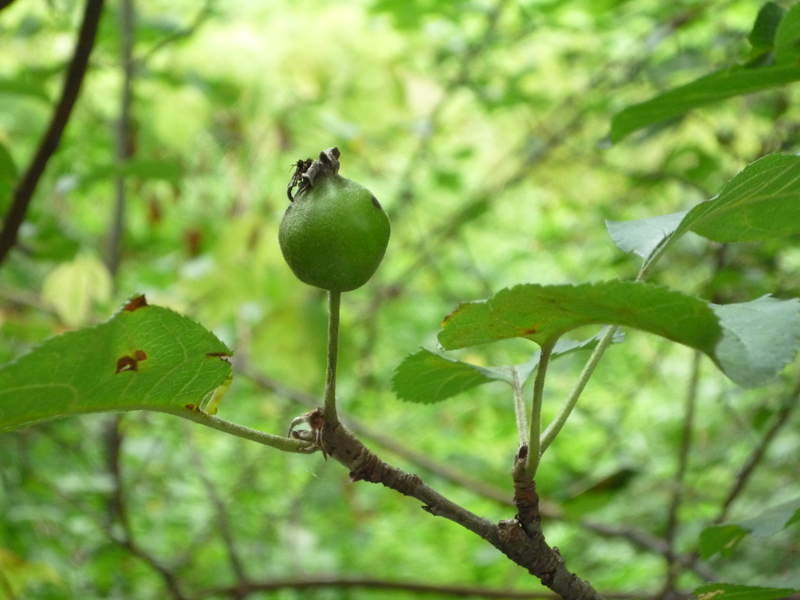 I was walking around, looked down, found a blue jay’s feather, kept going and came up to this wild apple tree. The feather was the ideal tool for me to follow the contour of the apple with my eye and let my hand trace it on the paper with ink. I did that over and over. The softness of the feather was ideal, it led my hands. I tried both right and left hands in making the curves. I enjoyed the gesture that came. It felt smooth and effortless. It was a liberating sensation to just commit to that one gesture, over and over. I got into a certain rhythm that felt meditative. 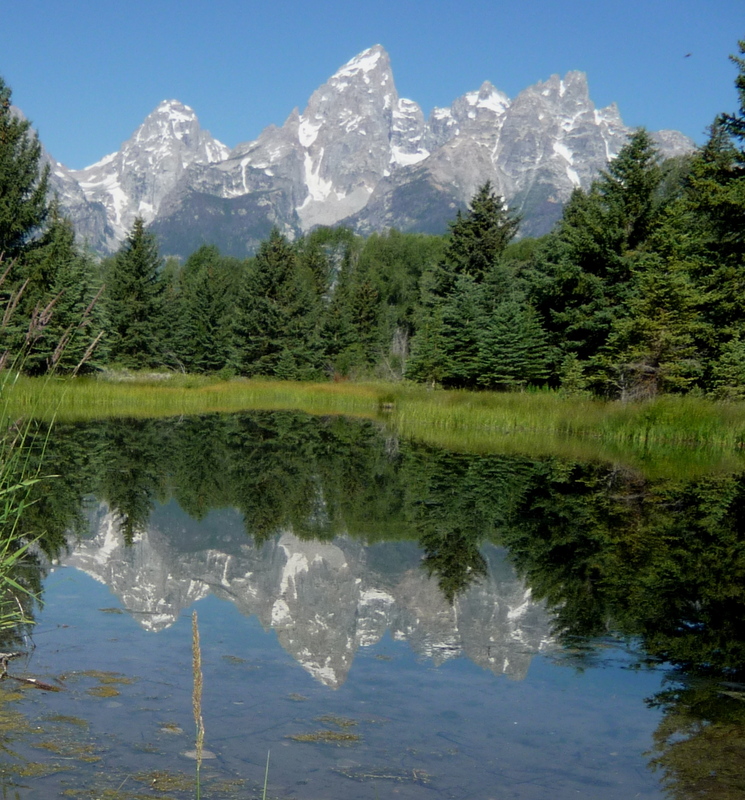 I brought with me this art of improvisation in nature while visiting Grand Tetons National Park last summer. With each tool I find in nature, I find a unique way of making a mark, a gesture. It’s an improvisation that leads to discovery. 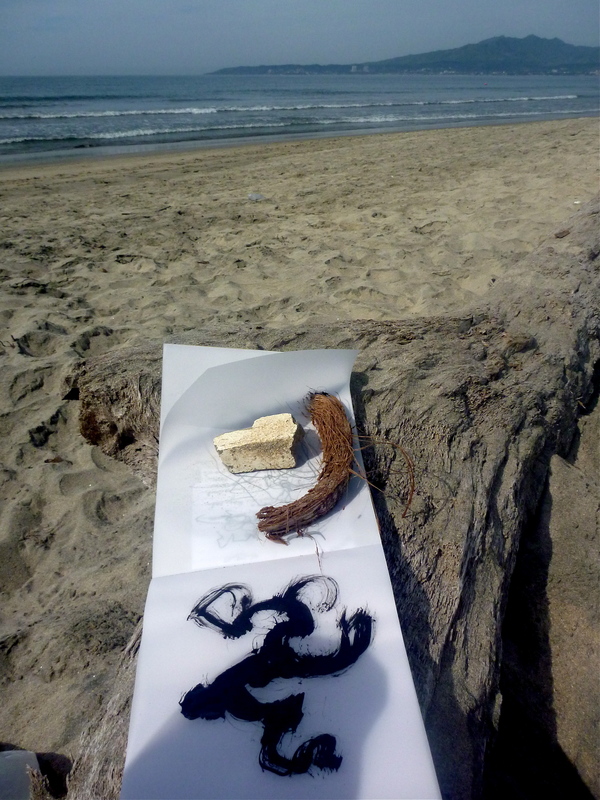 With the coconut husk I found at the beach on the Pacific coast of Mexico, I discovered I could get quite gestural with it and I responded to that. The husk also picked up the ink rather well, making a thick, rich mark. 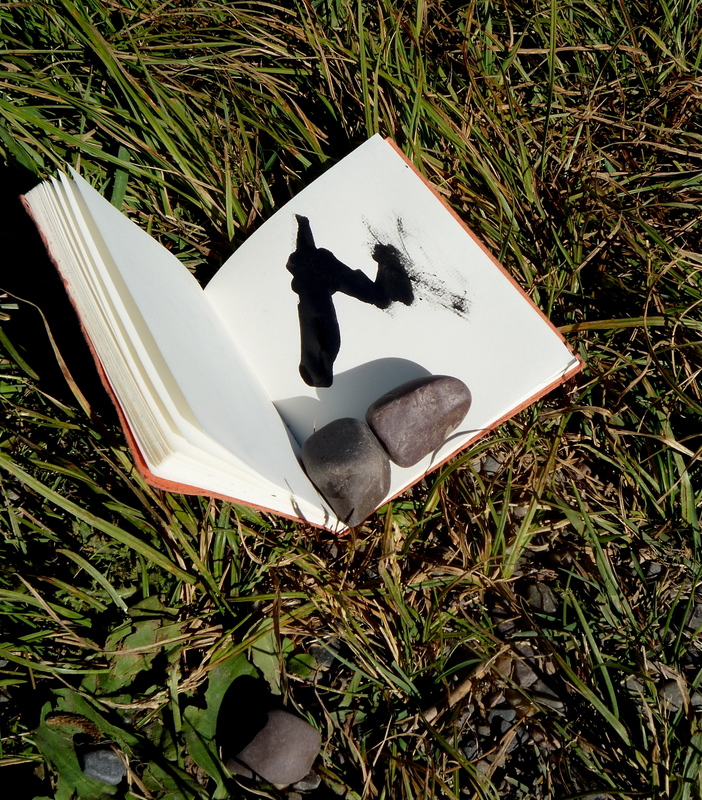 Improvising in nature with nature is for me a way to connect to the joy of being open to my creative process. 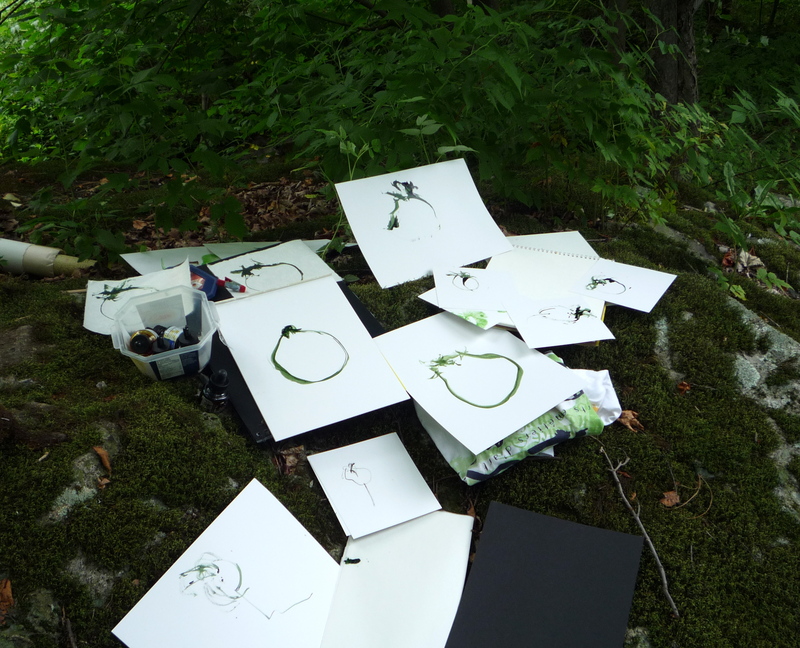 I enjoy being in natural surroundings and draw many of my inspirations from nature. I always find something that speaks to me. 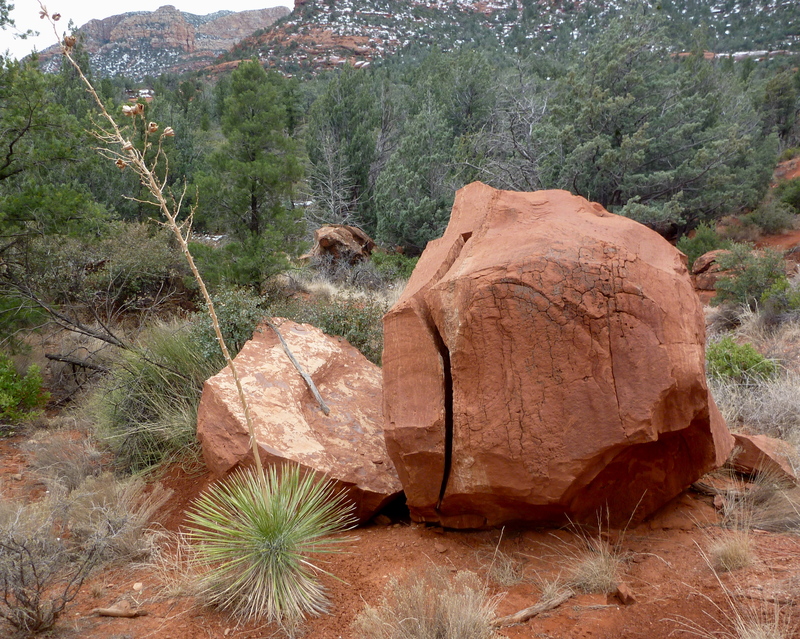 In my most recent travel to Arizona, two things emerged from my walking about and observing: a sotol plant with an old bloom by a boulder in Sedona, and the giant saguaros in Saguaro National park near Tucson. I did a few studies of both in encaustic. The shape of the sotol plant is a familiar one for me. And that’s why I was drawn to it. It reminds me of the agave, which has been part of my work for a few years now. Ever since finding an extraordinarily big agave within the grounds of the Rafael Coronel Museum (ex Convento San Francisco) in Zacatecas, Mexico, I have been working its shape in all manners I can think of! So working on the sotol&boulder theme was like paying a visit to an old friend. 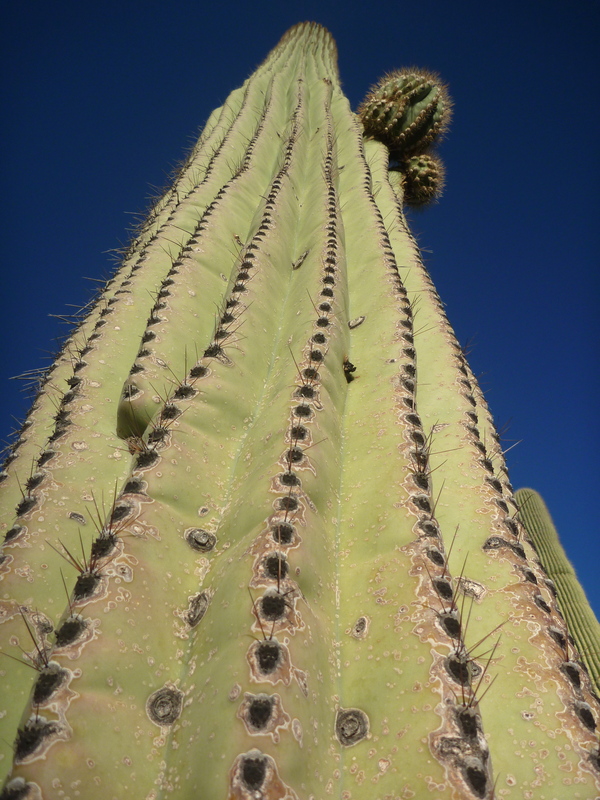 While I find the size and stature of these giant cacti most impressive, it is the pattern of the folds, and the structure that I concentrated on. I found that making grooves into the paper before hand gave me some interesting etched lines. You can view the pieces in the show “Two Journeys” at The Encaustic Center by clicking on this image. It will take you to my image gallery where you can find out information about each piece and see some in closer details. The opening reception is this Friday, November 20th from 6PM to 9PM. The show goes on until December 20th. On mullberry paper, the paints sinks immediately and, irremediably in the paper. I can add pencil and oil pastels marks, though the pastel tends to pick up the fine fiber of the paper and make it lint. There is no further moving of the paint around while on the hot plate, nor shading by rubbing with a paper towel… And that’s fine, when I want a pointilliste effect . With tracing paper, the paint absorption is reduced quite a bit and the paint swims on top. I can manipulate it a lot more. The paper towels can absorb a good amount of paint and thus reduce the paint layer, giving it more transparency. 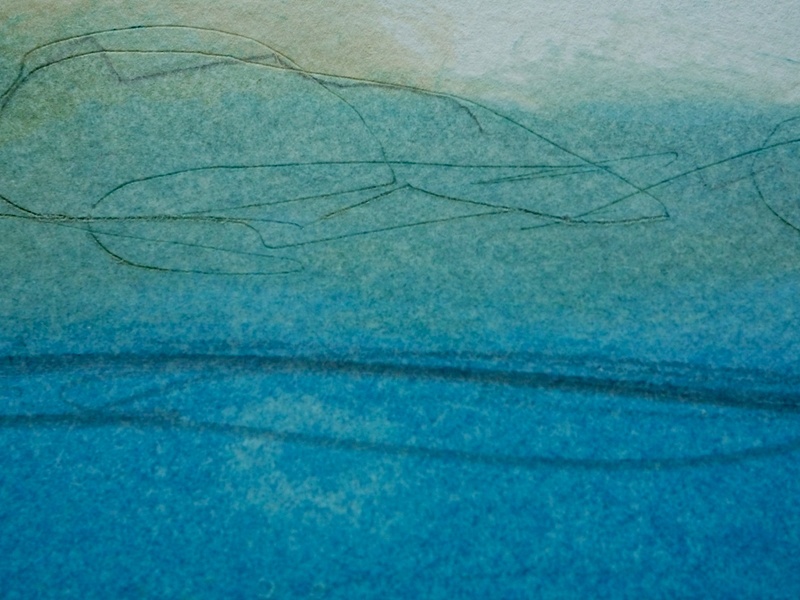 I can also wipe it away and leave marks, and textural effect (center blue “swish”, white lines). Where it gets fun for me on tracing paper is using oil pastels. The paper is so thin that the oil pastels melts quickly and gets creamy. It makes for stronger marks against the transparent surface. 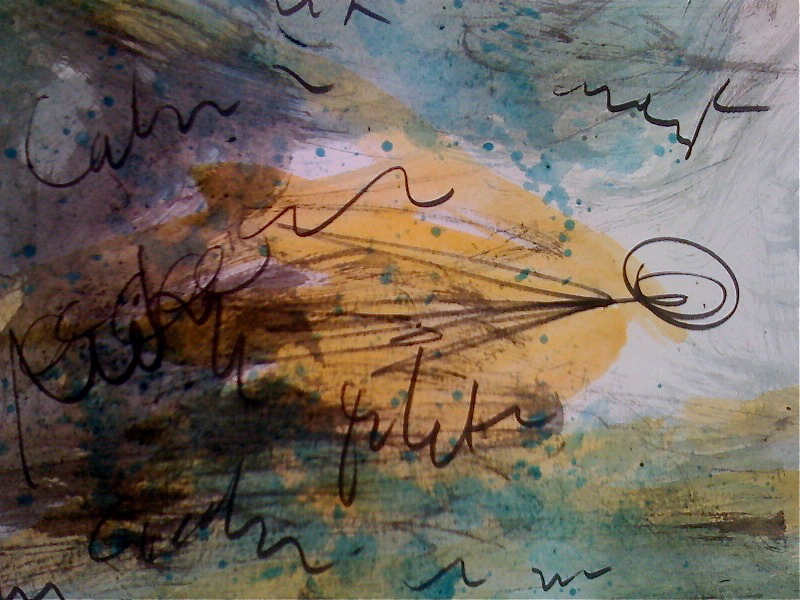 Watercolor papers lends ithemseleves well to rubbing the paint. Rubbing the paint in reveals the texture and grain of the paper. 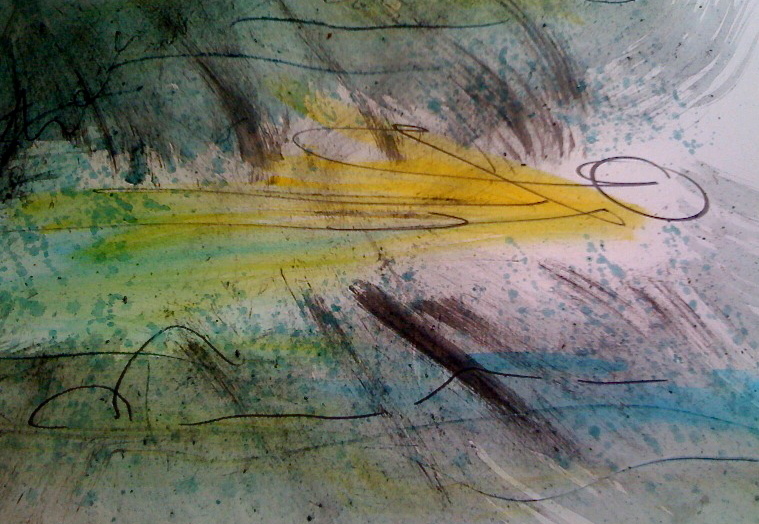 It also helps me blend the colors further into each other and into the paper. I can do some shading and gate some gradient. I can also add shades in areas where there was no paint by using a little paint on the paper towel and lightly rub the paper. It’s also a paper strong enough to withstand vigourous rubing so that I can fill in the line I etched in the paper with the paint (horizon lines in this piece). I use the sharp tip of an awl (could be a nail, anything sharp) to make a groove in the paper before I put paint on the paper. I like this because when I rub the paint in, the line appears (usually but not always). I love that reveal process and the fine feathery line. It defnitely reminds me of my drypoint printmaking experiences. I would say that watercolor paper is my preferred material for this technique because its sturdiness lets me pick and choose the effects I can play with. I like a material, technique that offers possibilities. With that comes a sense of freedom to explore. I brushed on warm encaustic paint on the griddle and apply the paper on top. I do not use much pressure and work pretty quickly. Encaustic monotype is very much a process that suits me. For all three paintings the fluid quality of encaustic paint is very much at the heart of my inspiration. 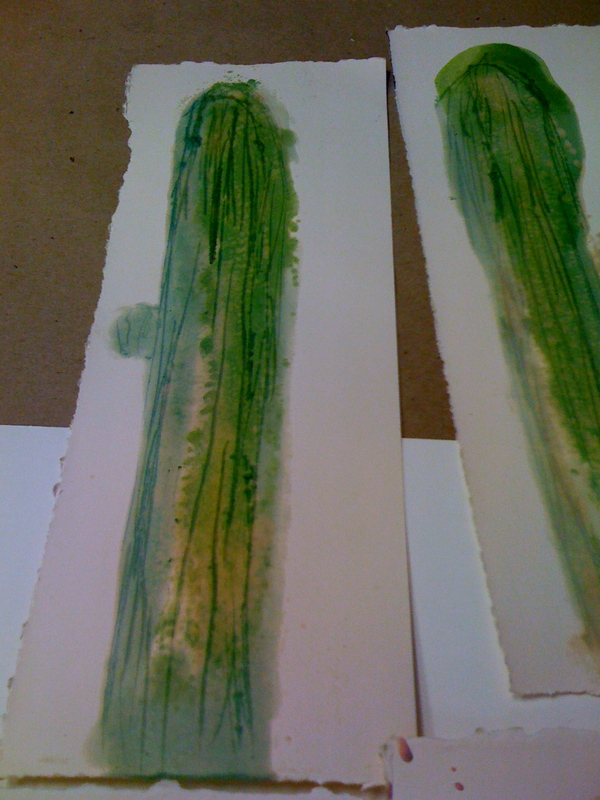 I liked the process of the paint moving about, dispersing onto and into the paper. I followed it. Where it spread and dispersed, I created expansive spaces, horizons, just like the landscapes that inspired me. 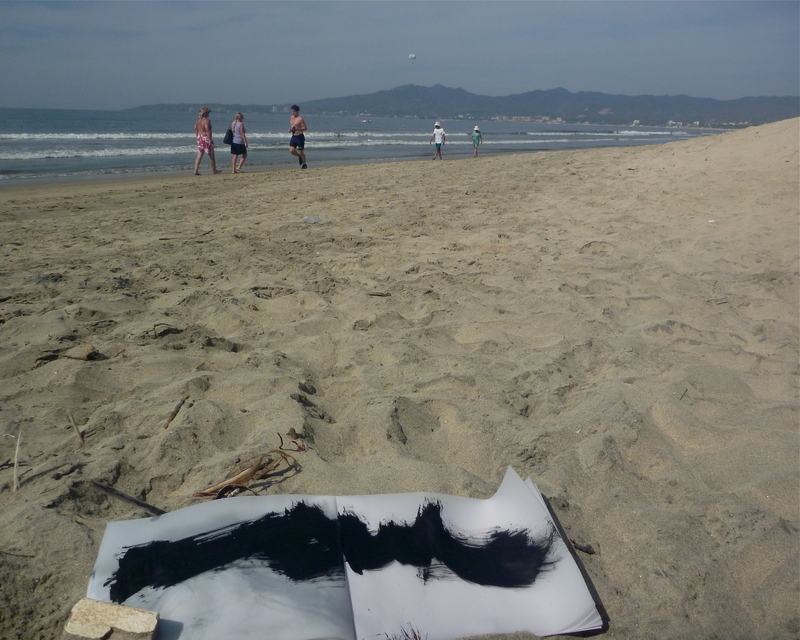 In the case of Morning sea ripple and Afternoon sea splash, the fluid quality of encaustic was very much the ideal material to embody and convey how the sea gently made its way towards the shore in the morning and bursted with energy as it crashed on the the beach in the afternoon. I also like the fact I can play a bit, explore and try color effects, textures and combine different approaches. Encaustic paint lends itself well to blending colors like in Afternoon Sea splash. 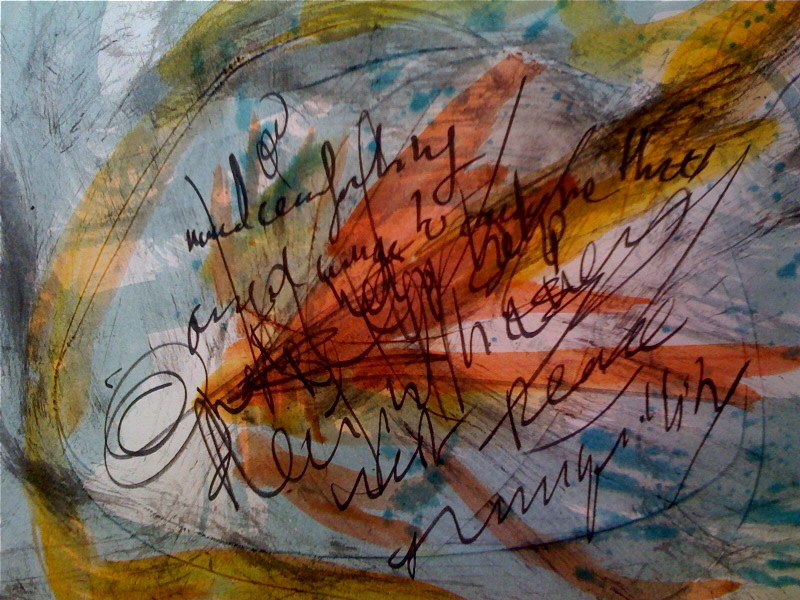 Colors were brushed on side by side and ran into each other once in contact with the paper. 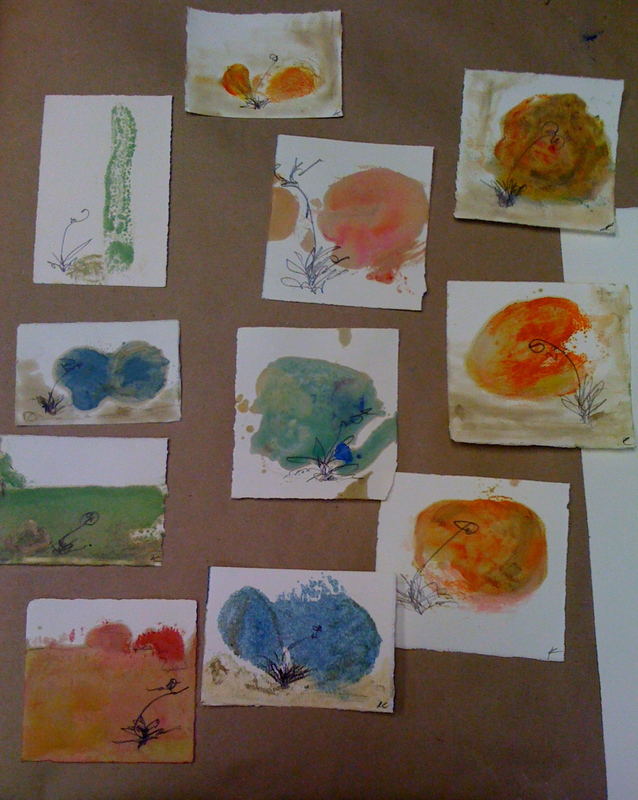 I take that ability to disperse further by reworking each monotype afterwards. I can rub part or all the of the medium, while still warm, into the paper, creating softness, lighter shades of color, for clouds and sky. I can add pencil marks while the paper is still on the hot plate to add definition, create contours, add details. I very much appreciate and enjoy the fact I can work as heavy or light as I want with this technique. In the seascapes, I created additional layers and textured surfaces by reapplying the monotype to some of the encaustic medium left on the plate and thus getting splashes, ripples. I can also work very minimally as in I am Enough, living the initial monotype where it landed on the paper, rubbing very lightly the encaustic paint and only adding a little sketch and a thin coat of cream paint at the bottom.